The U.S. Department of Transportation has released its first map of all the noise made by cars and airplanes across the United States. Though airports, ambulances, garbage pickup, and the neighbor’s sweet new sound system can cost us our hearing (and sanity), most U.S. residents live in safe noise zones. But some people, mostly city-dwellers, may have cause for concern around their exposure to constant, too-loud sounds. The National Transportation Noise Map shows that almost all U.S. residents—97 percent—hear background noise from highways and planes overhead at a safe 50 decibels, about equal to a humming refrigerator. A small fraction of citizens, though, hear noise equivalent to a garbage truck every day. Less than one-tenth of one percent of U.S. residents (approximately 223,000 people) hear 80 or more decibels on a regular basis. Sustained exposure to 85 or more decibels—heavy city traffic—can cause permanent hearing loss over time. In the New York metro area, pictured above, residents living near the region’s airports or under flight paths are at greatest risk for unhealthy noise exposure. The U.S. DOT’s Bureau of Transportation Statistics (BTS) compiled and analyzed data for the Noise Map, which is meant to help agencies track transit-related noise at the state and local levels. Officials can use the information to implement policies that reduce transit noise. The layers, which now include data up to 2014, will be updated annually and may eventually include noise data from rail and ships. 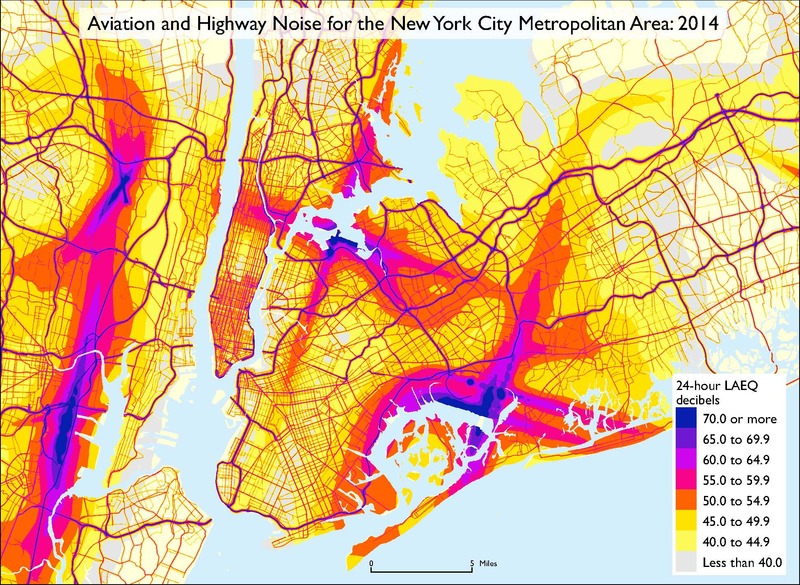 The Noise Map is part of the U.S. DOT’s National Transportation Atlas Database (NTAD), a collection of publicly-available infrastructure data.